An electric current on a long straight wire produces a magnetic field whose field lines are made up of circles with center on the wire. This magnetic field may be detected by placing a magnetic compass close to the wire as shown in the figure below. The direction of the magnetic field B may be determined by the right hand rule (right in the figure below): imagine grasping the wire using the RIGHT hand with the thumb in the direction of the current. The direction of the magnetic field is in the same direction along which the four fingers curl. 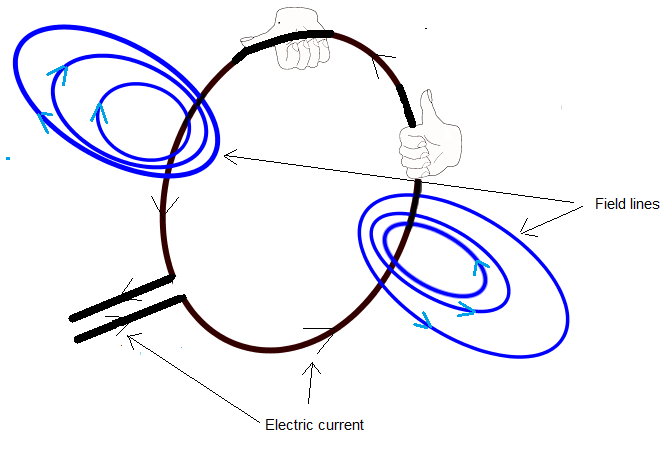 An electric current through a circular loop creates a magnetic field such that the line field are circles around the loop as shown in the figure below. The right hand rule may also be applied at different positions along the loop. 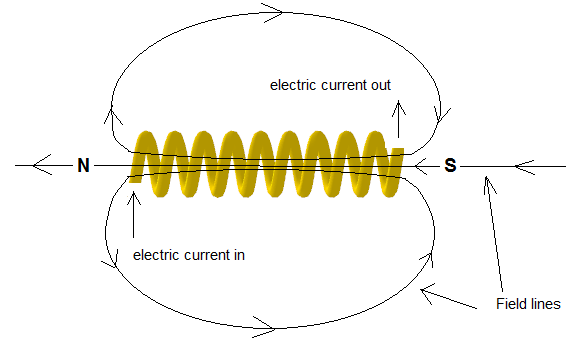 In order to produce a stronger magnetic field using electric currents, several loops are grouped together to form what is called a solenoid. A solenoid not only produce a strong magnetic field but also a uniform one with a north and a south pole similar to magnets. Solenoids have many applications. The magnetic filed produced by solenoids may be controlled by controlling the current in the solenoid. The current in the solenoid may be switched on or off and also by increasing or decreasing the electric current in the solenoid, we can control the intensity of the magnetic field produced.